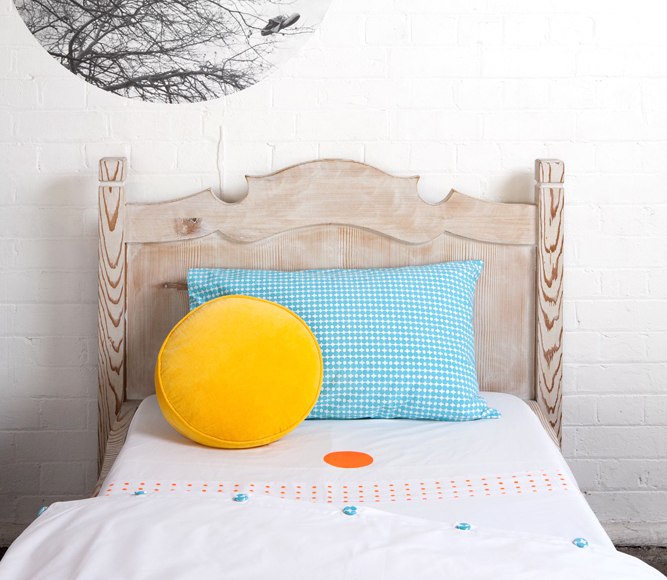 Crisp white bedlinen with pops of colour, bold art, quirky quotes, pom pom cushions and if that wasn't enough, polka dots. I LOVE polka dots! These gorgeous things make up part of the Castle range and are high on my wishlist. I mean, what's not to love? Created by Rachel Castle, a stylist and writer for lifestyle magazines living in Sydney, Castle is a collection of beautiful pieces for the home, often handcrafted or handprinted. Prior to Castle, Rachel worked in the homewear industry for 20 years both in Australia and the UK and then went on to become co-founder of a branding and design agency. Rachel now juggles designing the beautiful Castle range with freelance editorial work and motherhood. Oh, and did I mention Rachel's favourite colour is yellow? Enough said! You can purchase Castle from online shop Castleandthings.com.au or (good news for us kiwis), from Small Acorns, NZ. The Design Files, one of my favourite blogs, recently featured Rachel Castle's Sydney home which she shares with her husband Daz and children Cleo and Lucky. As expected, there is an abundance of colour, artwork and personality in every room. Here's a peek. You can see more of the Castle's home here. Daughter Cleo's room. What more could an 11 year old girl ask for?! cares when it's this gorgeous! Close up details of Cleo's room. I can't get enough!